The bark scorpion is found in North America, Central America, and the northern parts of South America and the West Indies. There are 41 species, with 24 subspecies, of this scorpion. They range in size from 1.5 to 3 inches and live in a variety of environments from deserts to moist forests. Bark scorpions can be found hiding under leaves, loose bark, crevices of trees, or any place else that gives them cover. 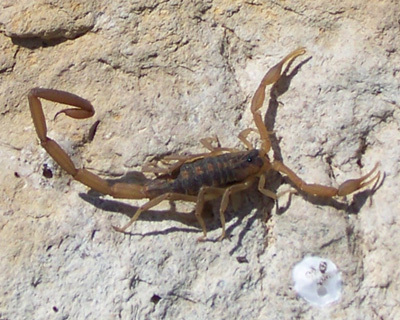 Bark scorpions are excellent climbers, fast runners, and very mobile. They are somewhat aggressive and will sting if provoked. Most species of bark scorpions are not life threatening, but some have venom that is very strong and potentially deadly. They are considered the most dangerous scorpion in the United States. Because of their aggressiveness and strong venom only an experienced collector should consider keeping this species as a pet. The bark scorpion needs a ten gallon tank with a locking screen top. Three to four inches of substrate should line the bottom of the habitat. An under tank heat pad on one side of the tank is needed. He will require plenty of hiding places and a shallow water dish. Crickets and other gut loaded insects will make up its diet.